Accent your living and entertaining space with the Claremont End Table Table. 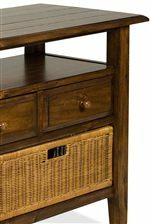 Crafted from Acacia hardwood solids and veneer, it features a medium toffee finish that has a rustic character with subtle distressing. One fixed shelf with removable wicker storage basket provide space to tuck away miscellaneous items, however it can also be used to place home accents and decor. It also features crisscross sides, adding charming detail to the otherwise simple design. Perfect next to your sofa or favorite living room chair. The Claremont Rectangular End Table with Storage Basket by Riverside Furniture at AHFA in the area. Product availability may vary. Contact us for the most current availability on this product. Drawer / Shelf Construction It's the cabinetmaker's choice for making drawer joints that won't pull apart over the years. Craftsmen dovetail joints both in the front and the back of the drawer. We spend a little more time here so that drawers will hold "stuff" for years to come. Case Construction The construction consists of a combination of cabinetmaker Acacia hardwood solids and hand-selected Acacia veneers. The use of these two hardwood materials allows us to design investment quality furnishings that are beautiful and will increase in value over time. Craft a cozy living space with the Claremont collection. Constructed from Acacia hardwood solids and veneers, each piece features a medium brown toffee finish rich with character. 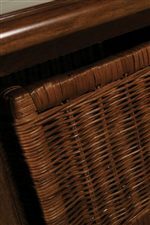 Plentiful storage options are provided with drawers, shelving, and even removable wicker baskets. Transitional in style, the Claremont collection makes it easy to make your living space homey and classy, all at once. The Claremont collection is a great option if you are looking for Transitional furniture in the area.